How about a little Elliott Carter as you sip your drink and nibble pretzels in a dimly-lit lounge? Don’t scoff. That’s the kind of ear-liberating musical experience you’d expect Matt Haimovitz to deliver. The Israeli-born cellist is leading the way for classical musicians who seek to bridge the seemingly unbridgeable worlds of contemporary art music and mainstream culture. Haimovitz’s successful, groundbreaking forays into pubs, coffeehouses, rock clubs and other alternative spaces have excited a generation of listeners who wouldn’t know Bach from the Beastie Boys. “I realize I’m pushing the definition of what your standard club audience finds intelligible,” says Haimovitz. Haimovitz will be joined by composer-performer Du Yun on vocals, laptop and keyboard for a program of new music for cello and electronics Saturday afternoon at Schubas, the popular Lakeview tavern. They are performing tracks from “Figment,” his latest CD on the Oxingale label, tying together these works with their own improvisations. Schubas was one of numerous watering holes that hosted Haimovitz’s 50-state album tour of “Anthem,” a similarly cutting-edge collection of the cellist’s favorite classical contemporary pieces (with a bit of Jimi Hendrix thrown in), in 2003. Fifteen years earlier, the cellist seemed to have settled into a conventional classical groove. He was only 17 in 1988 when he made his Chicago Symphony Orchestra debut and landed a Deutsche Grammophon recording contract. By the early 1990s he was launched on a successful solo career. All the same, Haimovitz felt frustrated. DG didn’t market his recordings very well and eventually dropped him from its stable. While he still enjoyed playing concerts and recitals, he wanted something more in his life. “I didn’t see my generation really understanding what I was doing or the music that I truly love,” he says. From there, the Great Haimovitz Club Crawl took on a life of its own, nationwide. “I was soon convinced there is an audience out there looking for aural adventure and discovery, and that I didn’t have to dumb it down to reach them,” he says. Haimovitz, now 38, divides his time between classical engagements and club gigs. He balances his bookings against a stiff teaching and administrative load at McGill University in Montreal, where he and his wife, composer Luna Pearl Woolf, live with their 2 1/2-year-old child. He also is busy curating the classical programs at eXcentris, an eclectic music club in Montreal. So what if his cello playing is accompanied by the clinking of ice cubes? More often than not, the laid-back settings make the experience that much more fun. 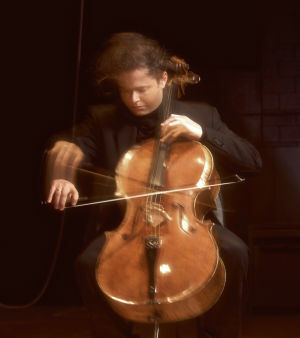 Matt Haimovitz performs new music for cello and electronics at 3 p.m. Saturday at Schubas Tavern, 3159 N. Southport Ave. $18; 773-525-2508, schubas.com.